Hello everybody, it's me, Robert Jr. here! With all this stuff my Dad tells you, you might have wondered "What does all this mean?" Don't go out buying books because I have made a learning center for you! When I first got into Astronomy (about 5 years ago) I didn't know much but I studied and I want to pass on what I know to you. The basic operation of the telescope is to collect light, magnify this light and focus it on a specific point. During the process of collecting light and the combination of lenses or mirrors magnifies the image. A simple Newtonian reflector magnifies an image and focuses it off of a secondary mirror near the front of the telescope and secondary reflects the light by 90 degrees into an eyepiece. By itself, the telescope can't magnify the image any more than what is present without the eyepiece. A Refractor is the earliest type of telescope and uses and objective lens and other lenses gather much more light than the human eye can and focuses the light on a focal plane at the rear of the scope where the eyepiece is located. 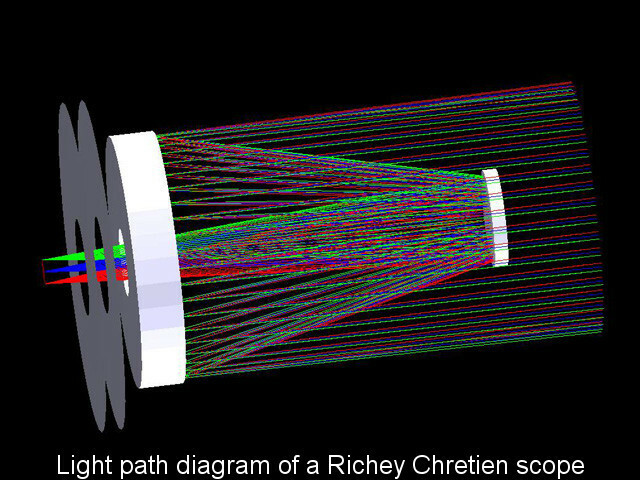 A Ritchey–Chrétien telescope (RC) is a specialized Cassegrain telescope invented in the early 20th century that has a hyperbolic primary mirror and a hyperbolic secondary mirror designed to eliminate optical errors. They have large field of view free of optical errors compared to a more conventional reflecting telescope configuration. The Hubble Space Telescope is a Ritchey-Chretien telescope. 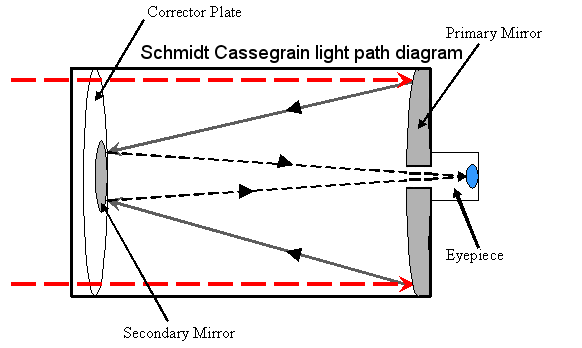 Schmidt Cassegrain - this design uses a spherical primary mirror and a Schmidt corrector plate to correct for spherical aberration. In this telescope configuration the convex secondary mirror acts as a field flattener and relays the image through the perforated primary mirror to a final focal plane located behind the primary. Some designs include additional optical elements (such as field flatteners) near the focal plane. Take out the eyepiece and look through the slot where the eyepiece is supposed to be, you will see a large, mostly out of focus image. DO NOT EVER ATTEMPT TO LOOK AT THE SUN WITH A TELESCOPE, IT WILL DAMAGE THE TELESCOPE AND BLIND YOU INSTANTLY!!! You MUST use a solar filter to view the Sun. It is the eyepiece's job to magnify an image for you to see. 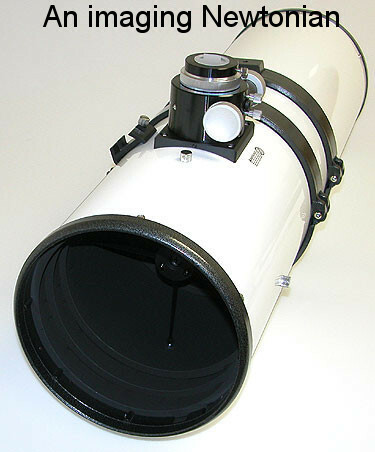 A Telescope requires that an eyepiece be placed in the appropriate slot in order to view objects. Think of your telescope as a giant as zoom lens; alone, without an eyepiece it is pretty much useless. In this example the telescope is the lens and the eyepiece would be a camera body. 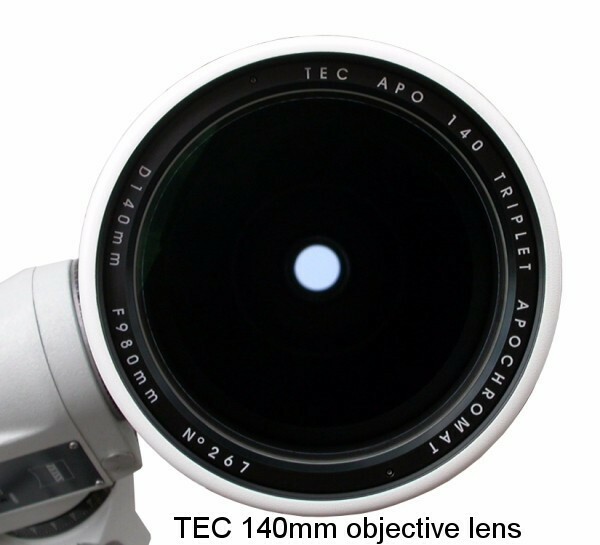 There are many different types of eyepiece currently available for various applications. For instance, there are wide angle, long eye relief, barlow, zoom, high power and illuminated eyepieces. Illuminated eyepieces have a tiny cross hair target in their center for precisely centering objects. 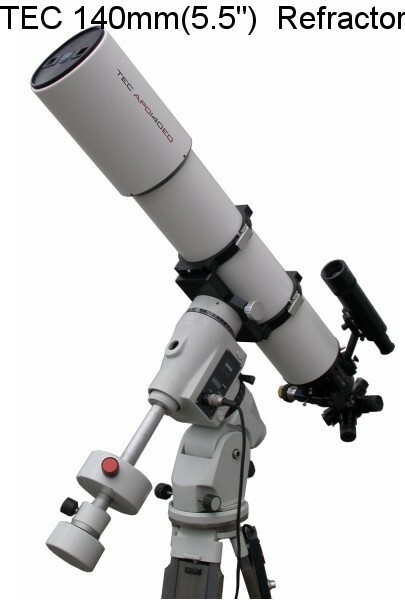 Most commonly these type of telescope eyepieces are used during the alignment procedure for the telescope. These eyepieces can also be used to assist in the alignment procedure by a observing stars and noticing which way the star moves which will then allow the astronomer to correct the tracking motion of the telescope. 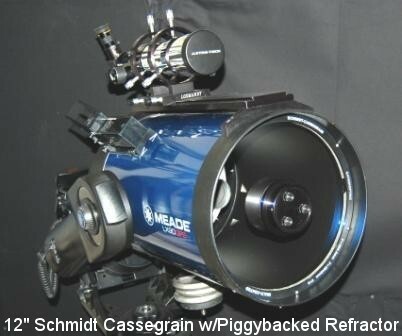 Many astronomers prefer high power eyepieces for observing planets and star clusters. One limitation to high power eyepieces is that they are dependent on the sky conditions and are most useful during nights were the sky is very clear and there is little wind. As you increase the magnification of the telescope the distortions you receive from magnification are dramatically increased when you use a high-power eyepiece, it is no different than trying to focus in on a distant object with a video camera or camera. Personally, it is quite rare for me to use an eyepiece that is below 10 mm(189X power magnification on my 12"LX90). My preferred eyepiece is a 26mm eyepiece which produces a 73X magnification, not too much and not too little but for me just right. After my alignment I usually switch to the 15mm Plossl which is 126X for visual viewing. If I plan on imaging I stay with the 26mm so if there are any problems with the GOTO accuracy of my scope I will have a better chance of locating my object with the wider view of the 26mm. The wide angle eyepieces offer a dramatic field of view especially for those who are new to the hobby. And variable adjustment (zoom) eyepieces offer the ability to have a wide angle view as well as the ability to zoom in on an object. Some eyepieces offer a dramatic increase in magnification of the object or they may offer a wider field of view to make viewing easier. There are even eyepieces that are available for people who wear glasses so that they don't have to take off their glasses to look through the eyepiece. Check back soon for more updates to my Learning Center!! !